Spring has finally sprung, and with it comes the return of outdoor fun. TDmonthly interviewed retailers about their best-selling outdoor toys so you can stock your store full of top products in time for warmer weather. Take a look at the top-10 best-sellers below, then choose which would be at home on your store shelves. The Original PlasmaCar continues to intrigue and fascinate. Powered by kid power; no batteries, gears, or pedals needed. Just sit, put your feet up, and turn the steering wheel to propel yourself forward. The patented safety seat design places riders in a safe, comfortable position and minimizes tipping. Moves up to 6 mph on any smooth, flat surface. Supports up to 220 lbs. Visit www.plasmacar.com to see all the wonderful colors available. — In a March 2015 survey, two out of 10 retailers told TDmonthly that Plasmacar is a best-selling outdoor toy. — As of 05/13/2011 this product had 4.5 out of 5 stars from 122 reviews on Amazon.com. Cons: Does not work well on surfaces that aren't completely smooth. — This top-seller in specialty stores earned a TDmonthly Top Toy 2007 award for its distinctive aerodynamic design and ease-of-use. TDmonthly believes it has the potential to become a classic due to its fresh, contemporary appeal and application in a child’s formative years. The Spooner is a balance trainer that simulates board maneuvers associated with surfing, skateboarding and snowboarding but not limited to that. The Spooner helps to develop flexibility and strength in the legs as well as creating a better center of balance. The Spooner is a core trainer, a stabilizer and a pasteurizer because of the ability to work the muscles closest to the spine. Also, it's loads of fun and can be done on any surface indoors or out. Made of H.D.P.E. it is unbreakable. Our guarantee is "You break it, we replace it." Made by Hand in the USA. Launch date: 2006. — In a March 2012 survey about outdoor toys, two out of 12 retailers told TDmonthly that Spooner Boards were among their best sellers. — In a March 2012 survey, Chris Lowe, owner of Beanhead Toys in Sandy Springs, Ga., told TDmonthly that Spoonerboards were one of her best selling ride-on toys. — Alexander McPherson, toy supervisor at Little Dickens in Lynchburg, Va., told TDmonthly in a March 2013 survey that Spooner Boards are their best selling item - they sell about 114 each year, with sales of the item concentrated in 4th quarter. Spring Ring by MARANDA ENTERPRISES LLC. Other products from MARANDA ENTERPRISES LLC. Spring Ring adds extra zing to indoor and outdoor fun. Use them to give favorite old games an exciting new twist or come up with something completely new and different. No Rules Required for this creative new toy. 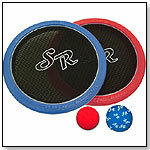 Constructed with a firm foam outer ring and a stretchy trampoline center fabric, the versatile Spring Rings can be used like a paddle, thrown like a frisbee. They even float. Great for indoors (when used with the dry splash ball) or outdoors. Awards: 2010 Creative Child Magazine, Preferred Choice Award; 2010 Dr. Toy Best Picks Award. — In a March 2013 survey, Joe Berardoni Jr, manager of Pun's Toys in Bryn Mawr, Pa., told TDmonthly that "The top selling outdoor item over the last two years has been the Spring Ring from Maranda...Even in the winter months, we have sold out of the item consistently, and have reordered several times already in 2013. We sell around 24-30 pieces a month during 'outside' weather months." — Joe Barardoni Sr., owner of Pun's Toys in Bryn Mawr, Pa., told TDmonthly in a March 2014 survey that the Spring Ring was a best-selling outdoor toy. 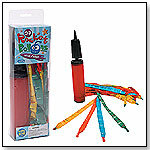 This bright set features 30 multi-colored balloons plus a pump. — Randy Austin reported that Rocket Balloons were popular sellers during the summer of 2008 at her store, The Gifted Child, in Lenox, Mass. — “Rocket Balloons were fabulous [last year] and we have people waiting for them now,” said Eric Masoncup, owner of Geppettos Toy Box in Oak Park, Ill., of his top-selling outdoor item during a March 2010 survey of best sellers. 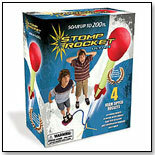 — Two of 37 retailers named Rocket Balloons are a best-selling outdoor toy in spring 2010. This free-standing modular display comes free with any $400 order. It holds Just Jump It merchandise including jump ropes, skippers, steppers and lariats. — "Our favorite Jump Rope co. Just Jump It has their act together! A New rack that holds all their product - what a concept!" John MacDougall owner of Golden Apple Learning Store in Pleasanton, Calif. told TDmonthly at Toy Fair 2010. 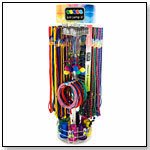 — Joyce Will, owner of Learning Express in Andover, Mass., told TDmonthly in an March 2015 survey that Just Jump It jump ropes are one of her store's best-selling outdoor toys.